Adding a bathroom in the basement is a good way to make your home more functional and possibly increase its market value too. An extra bathroom in the basement will also come in quite handy in case you have turned the basement into a games or hobby room – there will be no need to tread up the stairs every time nature calls. The basement bathroom project though will be a tat more complex to complete as compared to other above ground plumbing additions. Installing plumbing and bathroom features like pipework, drainage, sinks and toilets under ground level is more specific and takes consideration and good planning. In all cases, the project is best handled by qualified professional plumbers. However if you wish to give it a go yourself, some of the essentials listed below should help you keep things in check and on track. First up, consult with your local authorities on whether or not you can actually add an extra bathroom to the property as certain home improvement projects could violate local building codes. If there is no problem with fitting an extra bathroom in the basement, local building authorities will also provide you with information on sewer lines, drainage levels, slope gradients etc. all of which are vital for the successful outcome of your below ground plumbing exercise. The style, design and layout of your basement bathroom project is entirely up to you, though keep in mind that installing everything as close as possible to existing water supply and drainage lines is the best option you have. Drainage is always the most critical consideration of the project. Since gravity and the ‘push’ it creates will not be available to you in their full force, you will have to carefully consider two important factors – plumbing depth and pipe size. 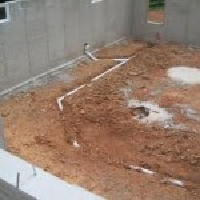 If existing plumbing is at a lower level than the basement, then drainage should be relatively easy. If drainage is running higher than the basement floor level you should choose a different option than gravity-fed toilets. When it comes to pipe size, you need a sufficiently wide pipe to accommodate the extra amount of drain water created by the basement bathroom. It might be necessary to change certain sections of plumbing in favour of pipes with higher capacity. Before commencing the project, check for existing plumbing and water outlets in the basement as many homes are constructed with the intention of being fitted with a basement bathroom – if such are available your project will be made much easier. Pressure-assisted toilet – air pressure compensates for lack of gravity force and assists proper drainage. Up-flushing toilet – a standalone unit that connects to the upstairs drainage of the house, and is perhaps one of the easiest, and more effective options. Sewage-ejector systems – a more expensive option, where the toilet ejects sewage upwards, assisted by an electrical pump unit. Sewage-ejector toilets are available in above ground and underground versions. Composting toilet – an ecofriendly option though unsuitable for any sewage other than toilet waste. The setup uses little if any water, but needs good ventilation.